Atop the main shrine, red roses floated in martini glasses filled with saffron water in a thoughtful row of extra offerings. Elegantly arranged ikebana decorated the shrines and the room was arranged for a feast. 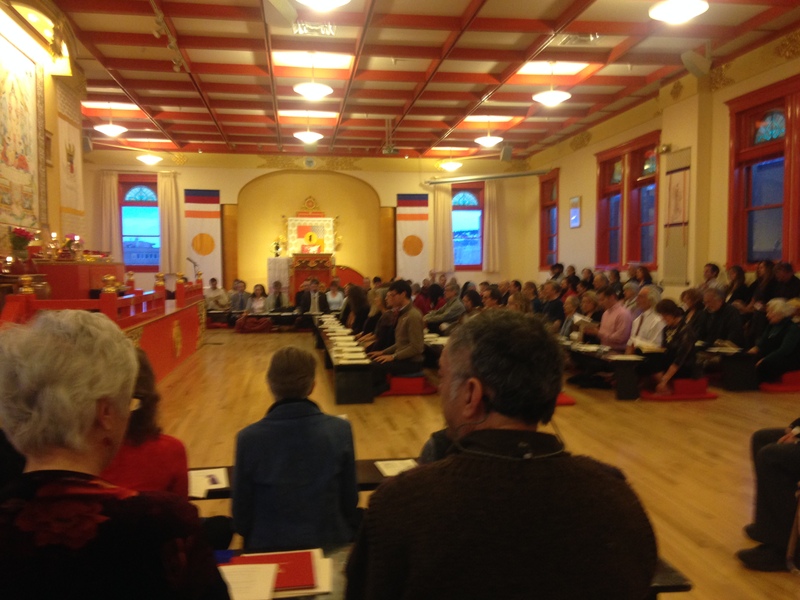 The Boulder Shambhala Center was celebrating the 27th Annual Parinirvana Day in remembrance of the life and teachings of the Vidyadhara, Chogyam Trungpa, Rinpoche, and the room was packed with multiple generations of his students and those of his son Sakyong Mipham Rinpoche. 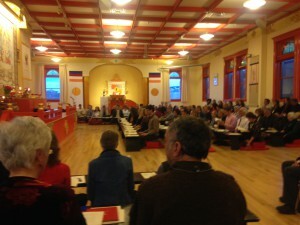 Sitting side by side at low puja tables, on this night 120 members of the local community had come to practice The Sadhana of Mahamudra, received by Trungpa Rinpoche while on a retreat in Bhutan in 1968. Although the feast portion of the Sadhana is normally a restricted practice, all students are invited on Parinirvana Day to sit together and eat in commemoration of this great teacher. The feast practice included bountiful finger-foods and sweets served by a joyful group of volunteers as well as the Center’s own staff, Noel Smith and Shelly Webb. 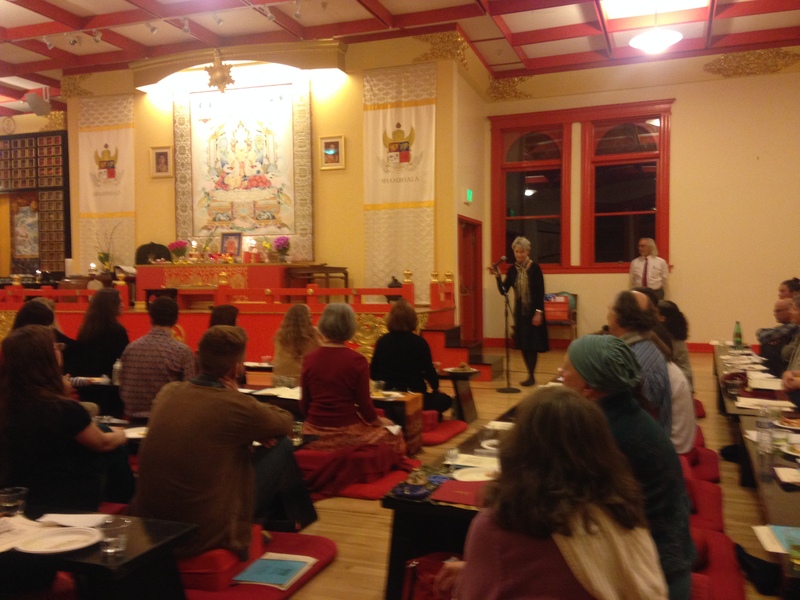 During the feast there were generous offerings in remembrance of Trungpa Rinpoche including stories by not one but two Sangyum, Cindy Grieve and Valerie Lorig, and other long-time students as they recounted their time with Rinpoche. A poem by Alan Ginsberg, “On the Cremation of Chogyam Trungpa, Vidyadhara” and Trungpa Rinpoche’s “The Doha of Confidence, Sad Song of the Four Remembrances” were read aloud and guests were treated to a beautiful rendition of a Milarepa song. A feeling of appreciation was truly palpable amongst those gathered for the occasion, and many, many toasts were raised, often accompanied by a sip of sake or wine, to Trungpa, Rinpoche, Sakyong Mipham Rinpoche, to the Mukpo Clan and to the lineage as a whole. As the feast offerings concluded the chopins offered the remainders of the feast food and the participants were treated to a video selection of Trungpa Rinpoche prepared for the occasion by The Shambhala Archives. Presented at Naropa University in July of 1976 as part of the “Viewing and Working with the Phenomenal World” Seminar, these teachings on Shunyata included a reminder of the empty nature of self-conception and identification. With his signature style, Trungpa Rinpoche reminded his students to “have a good time with that, whatever it is” that we might find exploring the empty nature of our minds and reality. The video selection was not only a pertinent and profound teaching but really brought the presence of Trungpa Rinpoche into the space. It was truly delightful to have him join us. The Sadhana of Mahamudra was completed after the video presentation and the evening was ended by a heartily sung Shambhala anthem and a lungta-raising warriors cry that reverberated throughout the Main Shrine room. 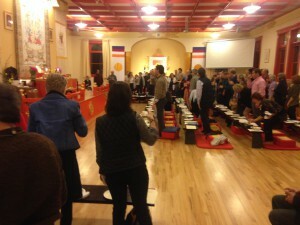 Shambhalians young and old made their goodbyes and paused before the shrine in appreciation of Trungpa Rinpoche and Sakyong Mipham Rinpoche as they trickled out. Many willing volunteers stayed to help clean afterwards and it wasn’t long before the feast set-up was broken down and the room reset in its meditation hall arrangement. 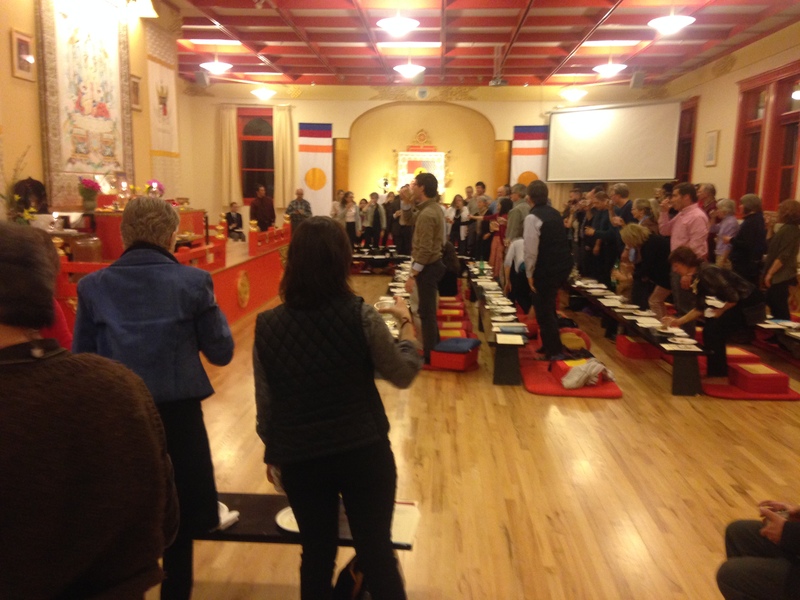 The Parinirvana celebration in honor of the Vidyadhara, Chogyam Trungpa Rinpoche and in gratitude to the lineage was an immensely heartfelt event greatly enjoyed by those in attendance and well hosted by the Boulder Shambhala Center.